Nickel finish set comes with badger "greys" or "silver tip" bristle brush. 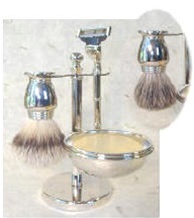 Set comes with solid metal brush, Mach3® blade razor, holder, lather bowl and glycerin soap in our "Outdoors" blend. Lather palm bowl lifts out of holder. Comes in gift box and this kit has everything you need to get started. First rate product, first rate service! I can't possibly say enough positive things about this company and the products they sell. I spent many hours searching for the perfect shaving set for my husband, who is a die-hard user of the Sensor blade cartridges. I wanted to get him something he would use and that would last. No sets on Em's site had precisely all the elements I wanted, so I called. They were SO nice and SO incredibly helpful! We put together a beautiful set that was exactly what I wanted, and my husband LOVED it! If you made it here, don't bother going anywhere else. Em's is the BEST!